The marriage bond, above, for "Frences Aldreg" and Margaret Cole is dated 19 October 1789 in Rutherford County, North Carolina.The could have been married that same day or soon thereafter, so the marriage date is not known for sure. 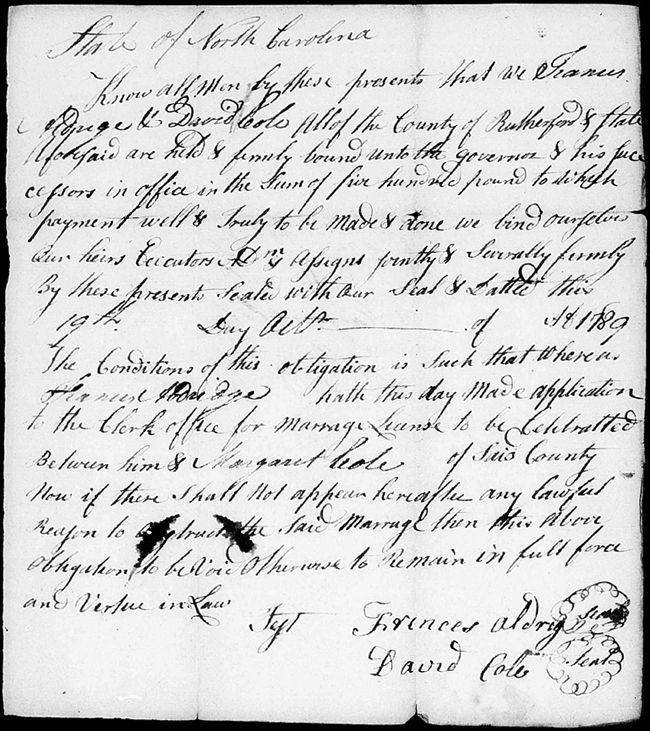 David Cole co-signed with Francis and he may have been Margaret's father or brother. Francis and Margaret stayed in North Carolina for the births of their first few children. David, Elijah and Nancy always state their place of birth as North Carolina in the census records. Margaret says North Carolina on an early census but on two later censuses she was born in Kentucky. Francis, the next child, gives Kentucky as his place of birth in all his census records. So some time around 1798 - 1800 the family moved to Kentucky. Marriage bonds,Rutherford County, North Carolina, 1779-1868. Clerk of the County Court, Raleigh, North Carolina: North Carolina Department of Archives and History, Division of Archives and Manuscripts, 1976. FHL MF 2447752: Abram - Byrd. Copy of the original marriage bond between Frances Aldrig and Margaret Cole.